The groups, part of the Kenyans for Peace with Truth and Justice (KPTJ) coalition, spoke about the status conference in The Hague on the level of cooperation being provided by the Kenyan government to requests from the prosecution for information in the Kenyatta case, the role of the ICC’s governing body—the Assembly of States Parties—if there is a judicial finding of non-cooperation, witness issues, the continuing need for justice for Kenya’s 2010-11 post-election violence victims, and proposed amendments to the Rome Statute, among other topics. Human Rights Watch’s (HRW) Elizabeth Evenson told the Toronto Star that the Kenyan government has worked to delegitimize the ICC. Abdul Noormohamed of the Open Society Initiative for East Africa maintained that the ICC is still the only place that victims of Kenya’s post-election violence can expect justice. HURINET-U and the Ugandan Coalition for the ICC addressed Ugandan President Yoweri Museveni’s call for African states to leave the ICC following Kenyatta’s court appearance, calling on the Ugandan government to cooperate with the Court. KPTJ’s Haron Ndubi pointed out that Museveni himself has requested that the ICC intervene in Uganda, while the Coalition’s Stephen Lamony noted that three previous attempts to get African states to leave the Court have failed. He also discussed the Kenyatta case and Africa’s perception of the ICC. Elsewhere, a group of Kenyan senators asked the ICC to withdraw the Kenyan cases. A Boston Globe editorial argued that the Uhuru Kenyatta case shows that international courts can never fully replace domestic justice mechanisms. Kenya’s National Council of Elders applied to make submissions in the case. Kenyatta was welcomed back to Kenya by large crowds. Academic David Bosco argued that the case has inflicted serious damage on ICC. Two people were killed in Bangui and six peacekeepers were wounded in an ambush. A group of Kenyan senators asked the ICC to withdraw the Kenyan cases. A Boston Globe editorial argued that the Uhuru Kenyatta case shows that international courts can never fully replace domestic justice mechanisms. Kenya’s National Council of Elders applied to make submissions in the Kenyatta case. HRW called on the Sudanese government to investigate allegations of sexual abuse during a police raid on an all-female Darfuri student dormitory. A group of Sudanese lawyers demanded the immediate release of the students. Sudan’s National Congress Party reaffirmed that nothing prevents President Omar Al-Bashir from seeking re-election. A state of emergency was imposed in East Darfur due to ongoing insecurity. The UN called on the Congolese government to reform its security sector and punish those who commit human rights violations in the name of the law. Activists say that efforts re-integration of former Lord’s Resistance Army abductees are failing. 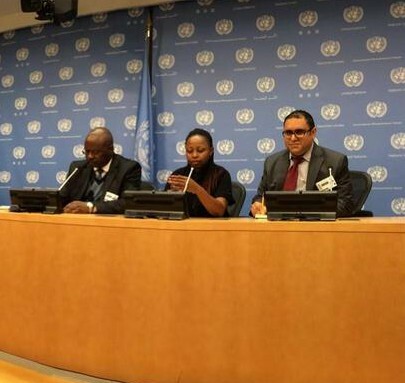 The International Federation for Human Rights, FORUM-ASIA, Amnesty International, the Cairo Institute for Human Rights Studies, Lawyers for Justice in Libya, HRW and ICJ called for an urgent Human Rights Council session on accountability for mass human rights violations in Libya. The UN human rights chief condemned attacks on human rights defenders in Libya. The head of the UN mission in Mali is set to leave his post. Simone Gbagbo’s lawyer said that she will face trial in Côte d’Ivoire on 22 October. An activist from Duékoué said that the Ivorian government must look closely at what happened there during the post-election violence in order to ensure reconciliation (in French). HRW called on Afghanistan to bar human rights abusers from top government posts. Georgia’s president said that a proposed treaty between Abkhazia and Russia undermines Georgia’s sovereignty and threatens regional security. The treaty would increase links between the two, namely by creating a joint defense force. Palestine’s ambassador in The Hague said that going to the ICC is not the Palestinians’ first choice for negotiating a peace with Israel. Two British international lawyers argued that the EU should stop opposing Palestinian ICC membership. Human Rights Watch’s Jo Becker argued that the United States can do more to get child soldiers off the battlefield. Switzerland’s foreign minister said his country should play a stronger role protecting children in conflict. An Observer columnist argued that African leaders should avoid the ICC by not committing crimes, not by demonizing the Court. An international campaign is seeking to make ‘ecocide’ a crime prosecutable by the ICC. South Korea will raise the issue of mass human rights violations in North Korea at the UN, but an official cautioned that it would be difficult to bring the matter before the ICC. ICC Prosecutor Fatou Bensouda was profiled in the Toronto Star. Meanwhile, meeting in Geneva, Bensouda and UN High Commissioner for Human Rights Prince Zeid Ra’ad Zeid Al-Hussein pledged to further strengthen collaboration.